disCoverJ is a free software for desktop, that attaches missing cover arts or album arts to all music files, by simply dragging and dropping audio files to the interface of disCoverJ. It can also attach cover arts in batch. It supports various audio formats, like mp3, wma, mp4, ogg, m4r, oga, m4a, flac, and ra. It uses iTunes, Deezer, Spotify, Discogs, Gracenote, Amazon, Bing, Google, and Local to find and attach album cover to the music files. There is a progress bar at the bottom to give information about current progress on getting missing album arts. 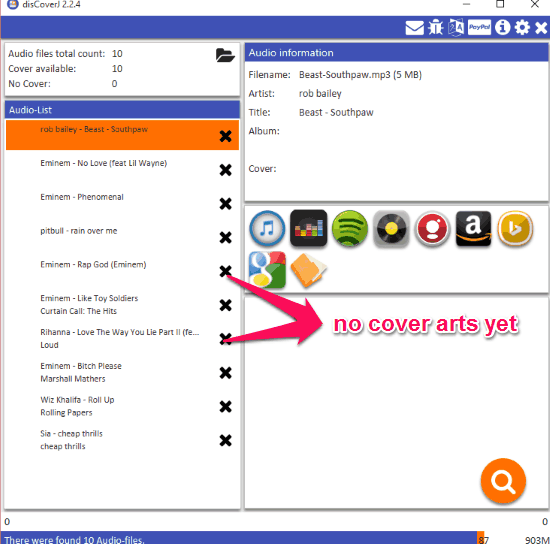 There is one such software which not only finds and attach cover arts but also adds lyrics and other metadata like: artist, genre, album name, etc. 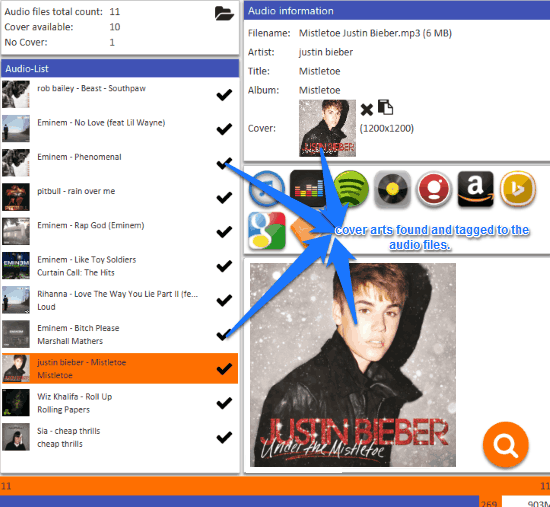 But if your focus is totally on getting missing cover arts for audio files, disCoverJ is just perfect for that job. disCoverJ is a good free software for adding missing cover arts to audio files on PC. It works on all operating systems including Windows, MAC, and Linux. Since it is a Java based program, so you need install the latest version of Java Runtime Environment before installing this software. 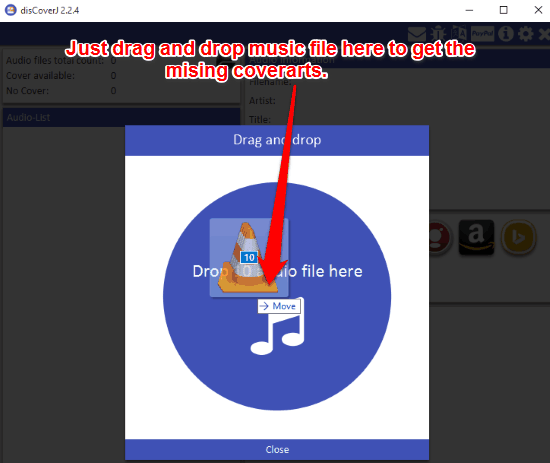 After installing this software you just need to drag and drop the audio files with missing cover arts to the interface of disCoverJ. Then very swiftly disCoverJ analyses the files and shows them as a list on the interface. Then you just need to select search icon to get the missing cover arts files (see search icon in above screenshot in bottom right corner). As soon as you click on the search option, it quickly starts searching for cover arts of the selected audio files through 9 different sources: iTunes, Deezer, Spotify, Discogs, Gracenote, Amazon, Bing, Google, and Local. The software uses any tags available with the audio files like name, artist name, year, album name, etc, in various above mentioned search engines. And as soon as the results are found, they get automatically tagged to the audio files. 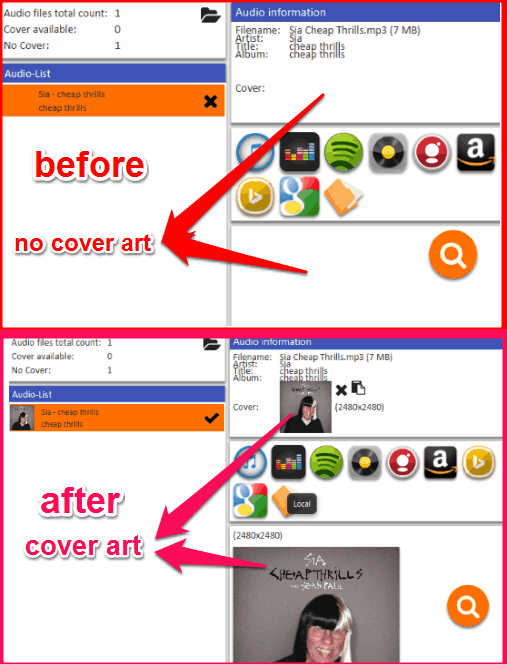 You can overwrite existing cover arts, and even choose to overwrite existing cover with only higher quality. You get to set minimum and maximum cover resolution for cover search. You can choose the option to Select Images manually after search. There is even an option to use same cover for all audio files with same album name or folder name. Sometimes there are audio files which do not have default cover arts embedded with them. disCoverJ solves this problem for you easily. Best thing about this software is that, its user inter face is quite simple making it easily usable by everyone. Although I would have liked it better if it also had the options to add missing metadata info like: artist, genre, album name, etc. But if your only concern is to get missing cover arts for audio files, then this software is quite good for that job.